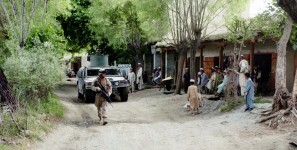 “By 19 April, the Alpha Command Group had displaced to JAF to direct Operations DETERMINED RESOLVE and CELTICS in Nangarhar, Kunar and Laghman while thc Bravo Command Group managed the RIP with 2-504 PIR in Khowst, Paktia and Logar. 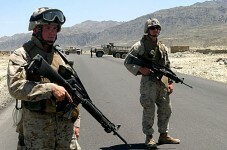 “Lima Company also continued security operations in the Nangarhar Province conducting VCPs along Highway One, particularly in the vicinity of the Khyber Pass, as part of shaping for Operation CELTICS. 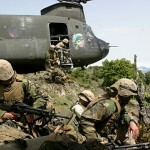 JALALABAD, Afghanistan, May 31, 2005 – When the U.S. Marine Corps’ 3rd Battalion, 3rd Marine Regiment, ventured into the Tora Bora mountains recently to hunt down enemy fighters, they instead found Afghans eager for a brighter future. 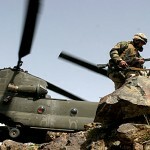 The mission, dubbed Operation Celtics, began as an offensive in an enemy sanctuary – the rugged mountains of Nangahar province that stretch along the Pakistan border. 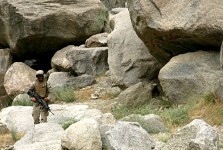 It was one of several missions launched last week by coalition troops to locate insurgents. 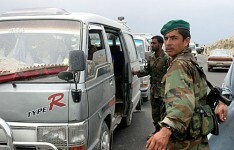 Afghan National Army soldiers took part in the operations. “Lima” Company Marines were prepared for a fight, but found themselves sipping tea with village elders. In the first few days of the operation, the Marines distributed roughly eight tons of civic aid. And not a shot was fired. “It’s a sign of success that we’re not getting shot at,” said Capt. 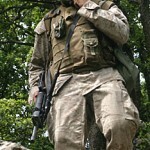 Eric Kelly, Company L commander. 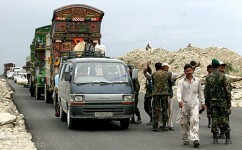 Insurgents operating in the area would likely rely upon local villagers for support while transiting through the high-altitude passes, Kelly said. Marines patrolled into remote villages, set up security and talked with local citizens to assess their needs and gain information on enemy activity. Keying the radio, Kelly called to battalion headquarters at Jalalabad Airfield, where aviation assets from the U.S. Army’s Company F, 3rd Battalion, 159th Aviation Regiment — known to troops as “Big Windy” — were on standby to airlift bundles of civic aid. 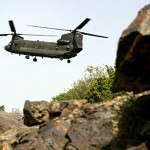 Within minutes, Marines heard the heavy “thud-a-thud” of the CH-47 Chinook echoing through the valley. 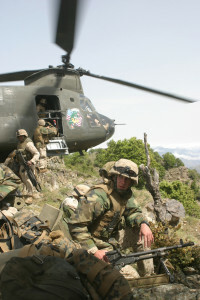 A U.S. Air Force controller working with the Marines popped a canister of green smoke to mark the landing zone and talked to the approaching Army pilot. 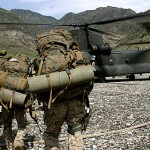 Marines rushed into the blowing dust to pull bundles of supplies off the helicopter’s back ramp. 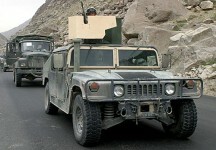 Security during the mission was key, said Sienicki, Lima’s weapons platoon commander. The Marines were “set up for success” by having Air Force A-10 Thunderbolt II jet fighters overhead during the mission’s initial stage, he said. 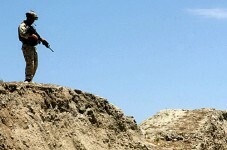 A platoon from the Afghan National Army marched alongside the Marines, contributing to interaction with the Afghan citizens and establishing perimeter security when the troops stopped near villages. 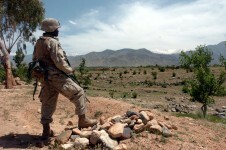 “If our Army works hard with the Americans and gets back on its feet, then we will no longer need the U.S. for support,” said Janet Ghul, an Afghan soldier from Chapahar province. Ghul and his fellow Afghan troops use their knowledge of the local culture to assess progress during the military operations. Ghul recalled how the Russian soldiers stormed his home and killed his father. 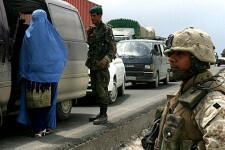 The coalition forces’ approach makes Afghans feel more comfortable, he said. 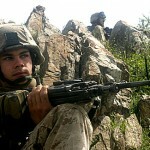 On a ridge overlooking the Pachir Agam valley, Marines set up camp outside the Gerakhil Primary School, a 12-room edifice built in 2004 by a U.S.-led provincial reconstruction team. About 700 local boys who once studied out in the open now have furnished classrooms, said Capt. Michael Greer, 35, an Army Reserve officer from the 450th Civil Affairs Battalion. 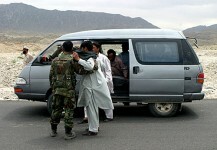 Nearby, Afghan villagers clustered around the helicopter landing zone. Sgt. Joshua Allison, of Stroudsburg, Pa., spent the afternoon of his 23rd birthday loading the arms of Afghan boys with bundles of blankets, rugs, food and medicine. 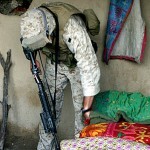 In the village, Navy Corpsman Daniel Mayberry, 21, of Gaithersburg, Md., began treating ailments and injuries in a makeshift clinic. Gaining the locals’ trust is the only way to get their support, said Cpl. 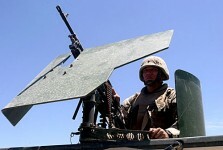 Stephen Patterson, 22, of Conyers, Ga.
Patterson often mans a 60 mm mortar on Marine firebases. 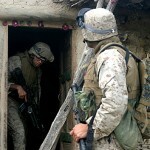 But when he gets out on patrols, he sees the Afghanistan’s future in the droves of children who swarm around Marines.